A company that won Overall Best Places to Work in Whatcom Co., 2018, is locally owned, and has an average 10+ year employment growing retention rate? Is comprised of a diverse team of individuals with educational backgrounds including: college, high school, ivy league, GED, tech school, community college. Is a nationally recognized multifaceted company, Birch has incredible career opportunities in: Diesel Technology, Mobilization, Central Dispatching, sales, public relations, programming, IT, marketing, accounting, procurement, management, and more. Prioritizes quality work-life balance, top-of-the-line business practices including: Kaizen, Lean Management systems, Continual Improvement, state-of-the-art investments paving the way in technology, software development and innovation to support, and also, improve internal systems. Provides great career development and invests heavily in paid training. Work for a successful company that provides and pays for all of your training, no matter what position you are hired for. Supports the local community and has invested over $2 million dollars to support schools, sports, arts, healthcare, youth programs, animal preservation, homeless, poverty, etc., In addition, The Birch Golf Classic is in its 3rd year raising money to transition children and women out of homelessness and prostitution along the I5 Corridor. Birch supports commercial contractors, home builders, government agencies from the Department of Defense to state and local municipalities, maritime industries and home owners by renting, delivering and maintaining a top-quality fleet of construction equipment, tools and supplies. To help build: Stadiums, college facilities, docks, roads, high rises, homes, parks and even landscaping. 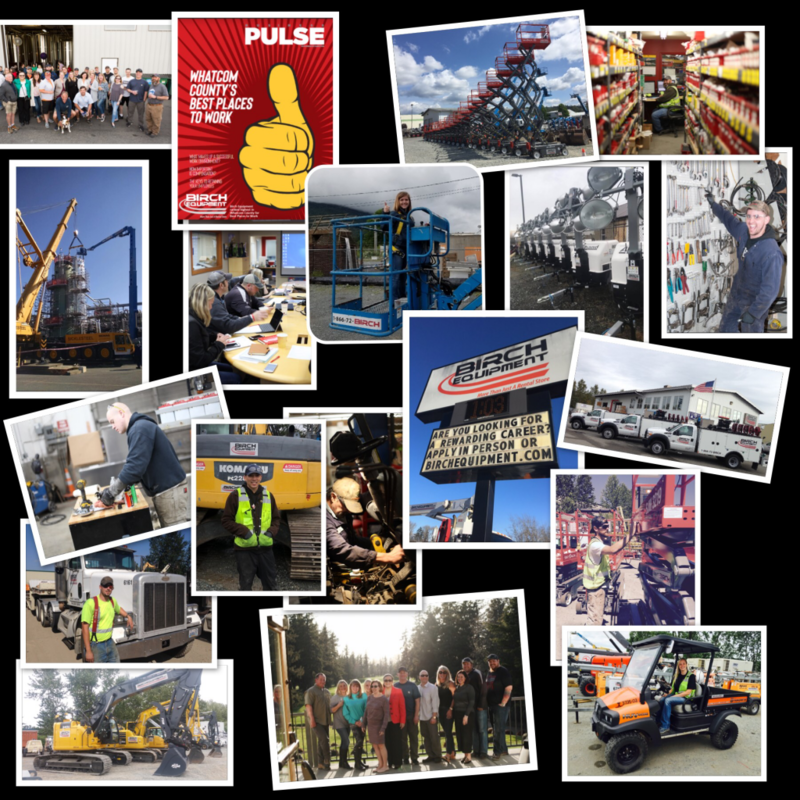 Founded and based in Bellingham with locations throughout Washington & Alaska, Birch is looking for people that want to enjoy and contribute to an elite equipment rental company that is continuously recognized both locally and nationally. Store Representatives: Maintain the check-in and check-out process of equipment and tools – work directly with Birch crew & our amazing customers. 90% of Operations Management started out in this position – great starting position if you’re interested in a career in sales, mechanics or management. Inside Sales: Directly assist the customer with rental, sales and service. Incredible internal / external customer relations, proactive sales, time and product management is a must. Diesel Technicians & Apprentices: Work alongside an incredible talented team keeping Birch’s fleet of 145,000 pieces of equipment and tools pro-actively running safely and efficiently throughout construction, manufacturing and home-improvement seasons. Own your own tools and be interested in working in the elements in the beautiful PNW. We’d like to meet you, if you can – hand deliver resume and Employment Application to desired store location. If you can’t, e-mail resumes & completed application to careers @ birchequipment dot com. If we think you may be a good fit for the position we’ll give you a call. Sitka, AK – 1382 Sawmill Creek Rd. *Due to current labor laws, Birch is hiring for 18+ years old, but is working to get legislation to change these laws.